» Lost-book story ripples across U.S.
Lost-book story ripples across U.S. The railroad book and old D.W. Lovett’s library card. The discovery of a long-overdue library book in an old Albany house has caused ripples of interest across the country, it appears. How the book ended up inside the wall of the 115-year-old house remains a mystery, but at least two people — a lady in Arkansas and another in Texas — did some sleuthing on their own. The story first appeared here on Feb. 9. The dilapidated house at 1405 Front Ave. N.E., is being reconstructed, and when the sheathing was removed from an inside wall, a worker found a 1907 edition of “American Railroad Transportation,” which had been checked out from the Albany Public Library. 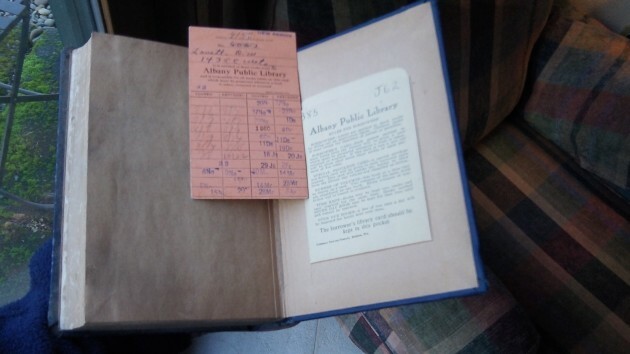 The card inside — in perfect condition just like the book — identified the borrower as D.W. Lovett and contained clues, though no proof, that it might have been checked out in 1935. Albany Democrat-Herald Reporter Jennifer Moody saw the story and expanded on it in the paper a few days later. The Associated Press distributed her account across the country, and it caught the attention of ABCNews.com, whose reporter Katie Kindelan called me for some quotes and ran a story on the network’s website, along with a link to this site, on Monday. At the break of dawn Tuesday, right after I had left for an early-morning appointment, our phone recorded a message from Heather, who said she was calling from Arkansas and had seen the story on the Internet. She had found some information online that might be helpful in tracking down our book borrower. I haven’t yet had a chance to follow up. Far more adept at mining available resources than I, she says she found information about the Lovett family on http://genealogybank.com and http://newspapers.com. See what you started with your sleuthing! Question…Did you realize a nice spike in visitors to your blog?